May 06, 2016 (LBO) – Saudi Arabia has agreed to periodically share ‎employment details of Sri Lankan workers during their stay in Saudi Arabia. The decision was made during a visit by Deputy Foreign Minister Harsh de Silva to Saudi Arabia recently. This would enable the Embassy to speedily reach out to Sri Lankan employers who are faced with serious problems and are in need of urgent Consular and welfare assistance from the Embassy. 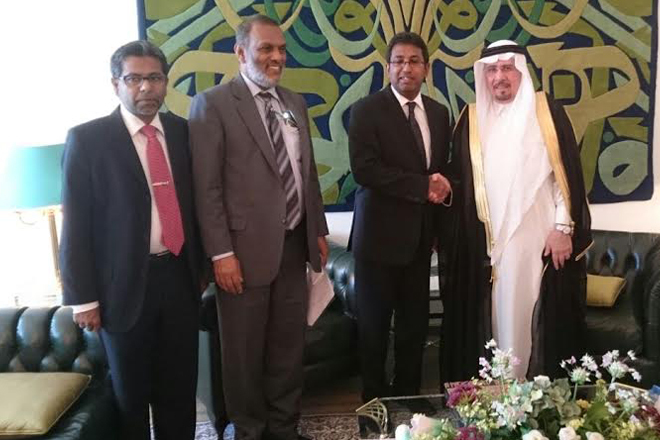 During meetings with Labour Minister and Deputy Interior Minister of Saudi Arabia, De Silva has articulated the problems of stranded Sri Lankan employees and ‎convinced the two Ministers of urgent need for finding solutions in the immediate future. Both Ministers have agreed to devise a mechanism for arranging exit permits for ensuring early repatriation of stranded persons to Sri Lanka, the Ministry said in a statement. The Saudi Deputy Minster for Public Health has agreed to make arrangements to expedite conducting postmortems and to minimize delays in dispatching the human remains to Sri Lanka.